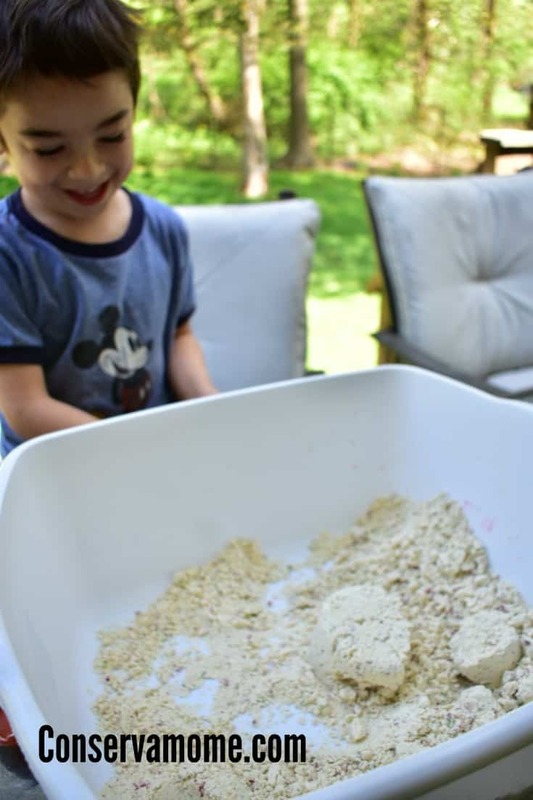 This fun and easy to make Moon Sand recipe is not only fun to play with but non-toxic and safe for little ones to play with. My energetic preschooler is always looking for fun. He’s active, inquisitive and always looking for adventure. So I always have to be a few steps ahead of him when it comes to fun. 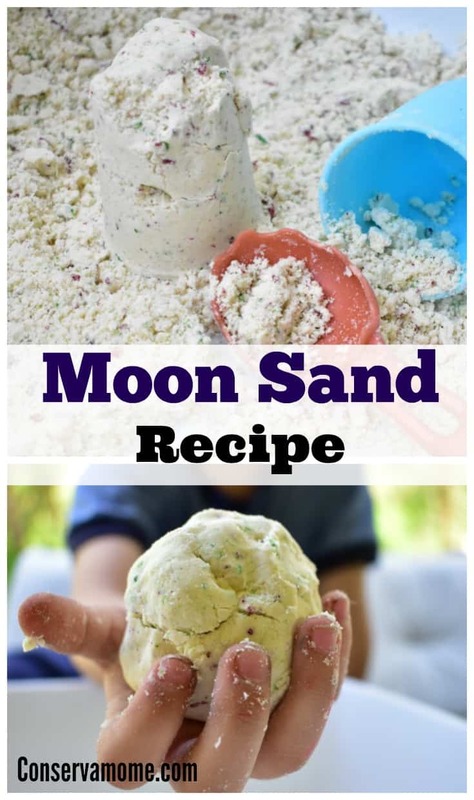 That’s why I absolutely love this Moon Sand Recipe. 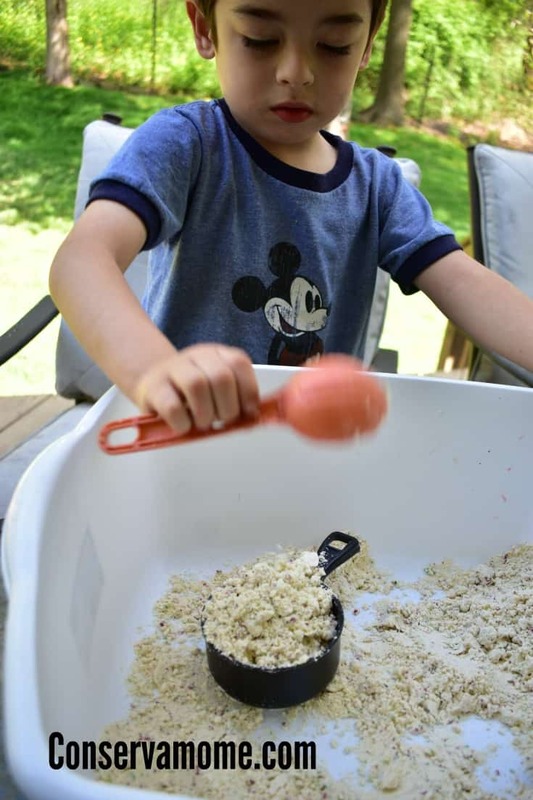 It’s a fun and easy way for your little one to have sensory fun for hours. YES HOURS. I will loose my guy for hours while he plays with this stuff. Because it uses nontoxic ingredients it also helps keep it safe for his little brother to play with. What I love is how easy it is to make. Most recipes you’ll find out there include baby oil as an option,but because I have a toddler that’s always sticking things in his mouth I figure the safe bet is to go with something that is less toxic. The ration is 1:8 meaning 1 cup of oil per 8 cups of flour. 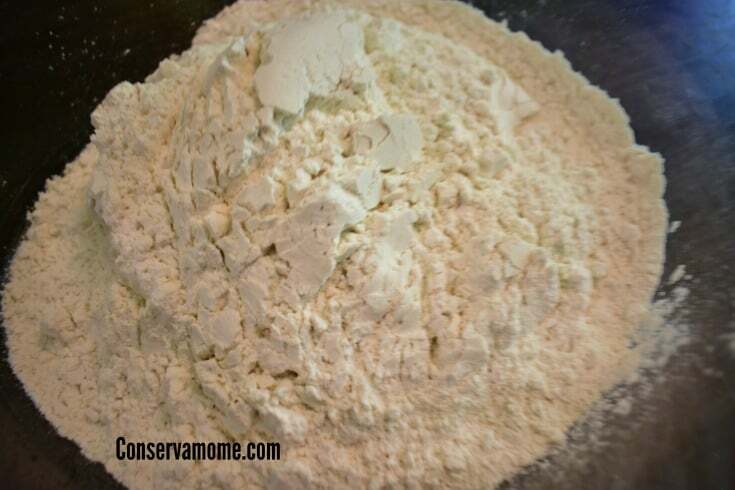 Meaning you use 2 cups of flour and 1/4 cup of oil. I tried to no avail to add various colors because well, food coloring is water based and oil and water really don’t mix. However, it did create some really neat color specs and so that’s why adding color is still a fun option. All you have to do is mix it all up and let the fun begin. I put it in a pan and my toddler went to work. It feels so neat and squishy in your fingers, best of all it holds shape making it pretty awesome to play with. You can use various cups and spoons to build stuff with it. or run it through your fingers and squish, squish, ,squish. It holds its shape so well you can even roll it up into a ball! 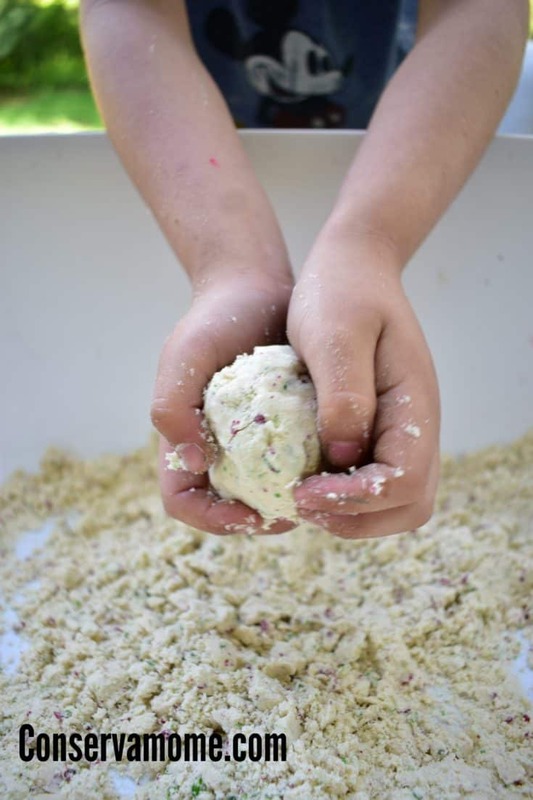 So if you’re looking for something fun to make with your little preschooler or even older kids, this is the perfect fun. 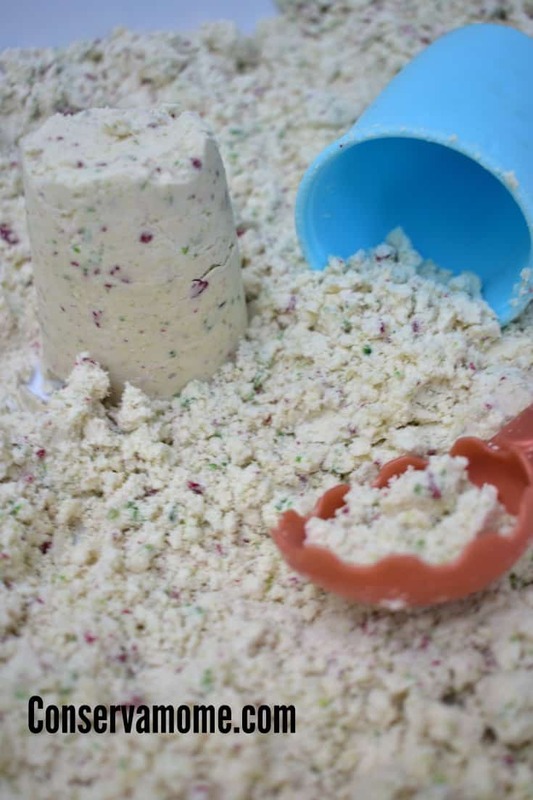 They’ll enjoy the fun,sensory experience and variety of Moon Sand. Looking for other fun ideas? Head over here to check out some more fun ideas for kids. Definitely an outdoor activity. Before I had kids, I remember giving Play Doh to a friend’s children. She laughed and said “I’ll remember this when you have kids!”, referring to the mess they make with it. I was searching for something to put in my grandson’s water table when it is not a good day to play in the water and found this. Perfect. Super fun!! I love the color specks!! Reminds me of funfetti!! 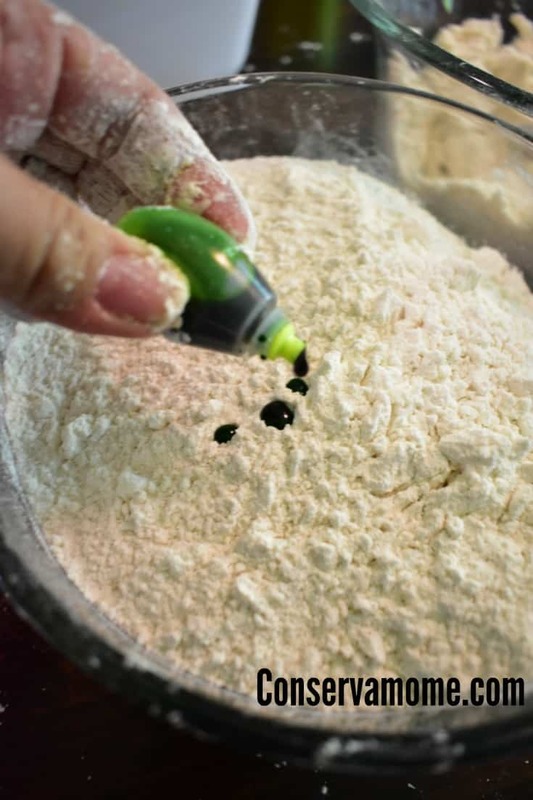 What a simple to make, non toxic sensory activity to make for kiddos. I want to play with it too! I had to pin it to have in the future with my grandson. 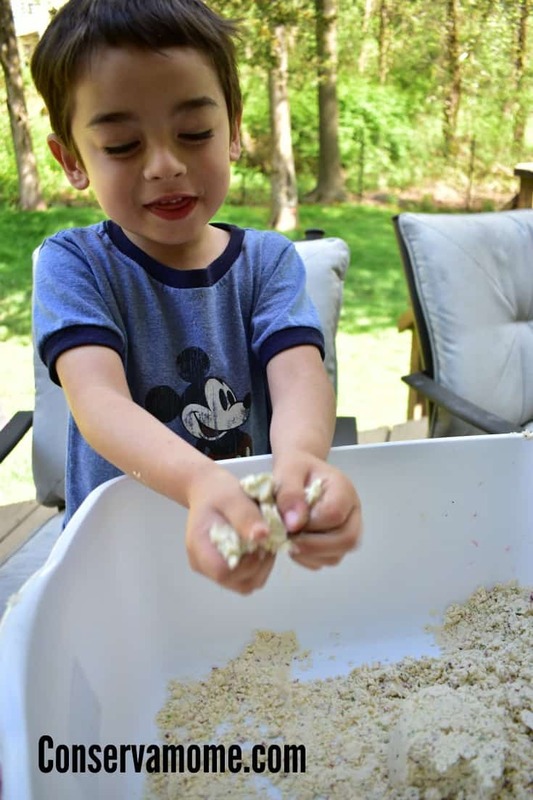 I try to do a sensory activity most days when I am with him. What a fun thing for kids to make! Quick, easy and great for good clean fun! Cheaper than buying it at the store too. I love how easy this recipe is! I wish we had younger kids in our familiy but all are older! This is awesome! My kids are going to have so much fun with this stuff. 🙂 Thank you so much for sharing how to make your own! My nephews and nieces would love this.